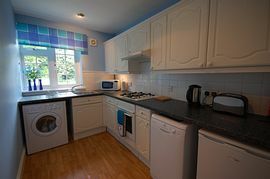 Kitchen: is very well fitted and equipped with gas hob and electric oven, microwave, fridge with freezer compartment, washer/dryer and dishwasher. 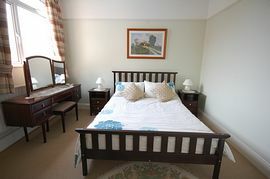 Bedroom 1: with a double bed, bedside tables, dressing table and large wardrobe. Bedroom 2: with twin beds and bedside tables. 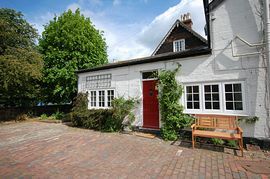 Bathroom: has a shower over the bath, washbasin and W.C.
Garden: Guests may share the owner's large garden which has garden furniture, barbecue and a trampoline. Parking: There is off-road parking for up to two cars. Also Provided: Wi-fi and Broadband access available. Bicycles can be supplied if required. Free range eggs and vegetables in season available. Ideal holiday cottage for those looking for a country retreat. 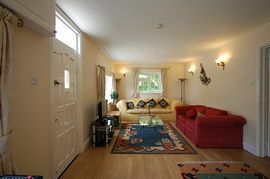 Apart from a small step the entire cottage is on a floor area is level inside. It is therefore suitable for partially disabled. 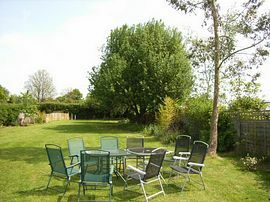 A large garden which has garden furniture, barbecue and a trampoline. Local Services: Within a seven minute walk there are good local facilities including shops, pubs, restaurants and a main line train station with frequent trains to London (50 minutes) and a regular bus service so you don't even need a car! NB: Prices may be subject to change at our discretion. Please note we have a policy of requesting a security deposit (at time of final payment) of £50 to cover any major breakages. This is then returned to you after your visit. We will do part weeks or long weekends out of summer season and school holidays. Short breaks of up to 3 nights, charged at 75% of the weekly rate, 4 nights at 80% Longer lets are also considered - please contact us.